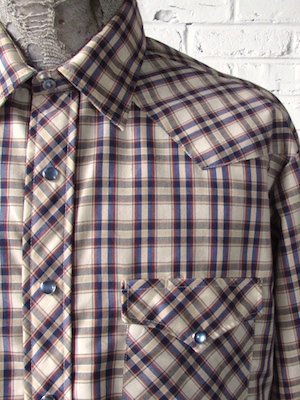 Home > Vintage Western Shirts > All Vintage Western Shirts > (XL) Mens Vintage HBarC Western Shirt! Khaki, Tan, Red & Blue Plaid! 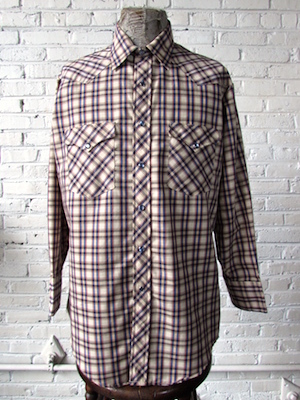 Mens Vintage H Bar C Western Shirt! Khaki, Tan, Blue and red plaid. Closes in the front with pearly light blue snaps with four matching snaps on each cuff. Patch pockets on both sides of the chest with western style flap closures that are secured with two more pearly blue snaps. Shirt has a tapered hem. Made in the U.S.A. Tagged HBarC Ranchwear, Long Tail. No material tag but feels like cotton.